January 10, 2018. For immediate release. Scripture Listening app Dwell launched on Kickstarter this week to an enthusastic response, earning over 50% of it's $50,000 funding goal in 24 hours. Dwell is an upcoming mobile app, built by the creators of Lightstock.com, aimed at helping people cultivate a habit of listening to the most important book in history, the Bible. 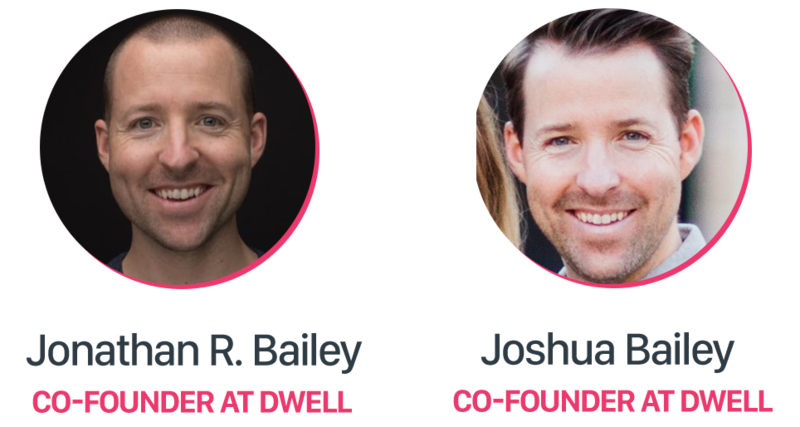 Co-founders Jonathan and Joshua Bailey are finally realizing a vision they've had for a decade. "For the last ten years, we have had this idea for a beautiful, easy-to-use, scripture listening app in the back of our heads. Mainly, we wanted an app like this for ourselves. For the longest time, we figured someone else would build it because, in a world of smartphone dominance, it feels like such a no-brainer. In 2016, we finally found ourselves with the freedom to go out and tackle it." Why not just use one of the many recordings of scripture available today? "The best a CD or cassette tape or even today's popular Bible apps can do is get you to a particular book, but navigating to a specific chapter, or even verse was next-to-impossible. The wonders of web and app engineering, however, solve this problem, allowing the Bible to be parsed out verse-by-verse. This means we can now create all kinds of interesting ways for you to explore the Scriptures, from new Listening Plans to cross-gospel Stories to topical Playlists." The team has commissioned four new and original audio recordings of the Bible after doing 150 in-person auditions. These voices are varied and unique, offering 4 distinct reading styles that can appeal to everyone. The team has also partnered with Steinway artist & composer Chad Lawson to compose original in-app music. It’s tailor-made for listening to scripture because it doesn’t distract, it draws you in. Listening without music will always be an option. Like listening, art was another primary way Christians took in Scripture throughout the centuries. And like music, Artwork can also draw us into the text more deeply, providing a visual to the audible. We’ve created original artwork for Dwell, illustrating Scripture in interesting and evocative ways. Dwell will be available for both iOS and Android, with an expected release for iOS in June, 2018, and an Android release early next year. What an amazing app. Beautiful to look at, plus powerful voices. Millions of people are longing to hear God speak through the Bible. Dwell gets that. I love the voices—and the options to change them. I can’t recommend it more highly. A tremendous opportunity to hear the Scriptures in our day. The level of care and attention to detail put into Dwell is beautiful. I can’t express how excited I am to make this app a part of my daily life. We’ve been in the faith-based space for 12 years now and love it. Our driving passion is to build companies and products that help advance the kingdom of God. We began our journey in 2006 when started our first company (gracewaymedia.com). Graceway comes alongside pastors and helps provide a visual complement to whatever it is their preaching on a given Sunday. We were blessed with an opportunity to sell that business in 2012, and immediately began work on a new company (Lightstock.com). It’s geared towards helping faith-based designers and artists tell better stories through the use of professional faith-focused stock resources. Today, it’s a thriving platform that sees thousands of downloads every month. For the last ten years, we have had this idea for a beautiful, easy-to-use, scripture listening app in the back of our heads. Mainly, we wanted an app like this for ourselves. For the longest time, we figured someone else would build it because, in a world of smartphone dominance, it feels like such a no-brainer. In 2016, we finally found ourselves with the freedom to go out and tackle it. Since then, we’ve been going slow, building a team, recording audio, and doing development work as resources have allowed. When we told the world what we were up to last September we were shocked by the response. In a three-week period, we had over 7,000 people express interest in Dwell! This gave us a boost of confidence and validated the need for an app like this. We cannot wait to bring this app into existence! Copyright 2017-2019 Dwell App, Inc.